Hungry for some jet noise, I made the trip over to EF in hopes of catching a few Super Hornets from VFA-25 that I heard were to be stopping by for some fuel. Upon arrival I parked at the FedEx complex south of the base along HWY 3. Within 20-25 minutes or so the first Hornet arrived. I was so excited when I saw him in the over-head because it was the CAGs jet. As he flew over I kind of laughed internally because myself and a couple other spotters never mention the words “color jet” if we hear about several coming in from the same unit as we think it will jinx our chances of seeing one. Is it silly? Yes. But, it’s kind of funny, too. Shortly after he touched down a T-45C from NAS Kingsville came in, and a little later 2 more Hornets from VFA-25. At this point I decided I better go on base to try and catch a few static shots of the CAG bird and the others. As I was standing along the fence-line the two alert F-16Cs from the 138 FW quickly taxied down RWY 35L and made a very fast departure to the east. Although they are based out of Tulsa, OK they fly alert missions out of Ellington as the “Gulf Coast Defenders”. The reason I could tell they were the alert birds is because of the yellow and brown color bands on the AIM-9s and AIM-120s which signifies “live” weapons. A little later the last two Hornets from VFA-25 arrived. After taking on their fuel and a little bit of a break, the Hornet pilots suited back up for their departure. This was another great outing for me. 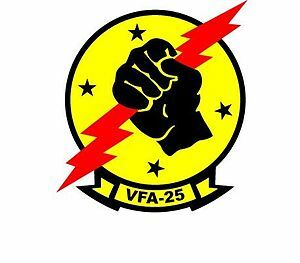 I believe the last time I saw VFA-25 was back in 2006-2007 when they were flying the legacy Hornet. Nice to catch them flying the Echo model, but what made it even sweeter was seeing their CAG jet. Next → Next post: Presidential Convoy visiting the UK!